ທ່ານບາຣັກ ໂອບາມາ (ອັງກິດ: Barack Obama) ມີຊື່ເຕັມວ່າ ບາຣັກ ຮຸສເຊນ ໂອບາມາ ທີ່ 2 (Barack Hussein Obama II). ເກີດເມື່ອວັນທີ່ 4 ສິງຫາ ຄ.ສ. 1961. ເປັນປະທານາທິບະດີສະຫະລັດອະເມລິກາ ຄົນທີ່ 44 ແລະ ເປັນຄົນແອຟະລິກັນອະເມລິກັນຜູ້ທຳອິດ ຮວມເຖິງຍັງເປັນຊາວອະເມລິກັນຜູ້ທຳອິດຜູ້ເກີດໃນທົດສະວັດທີ່ 60 ຜູ້ໄດ້ຮັບເລືອກຕັ້ງເປັນປະທານາທິບະດີ. ທ່ານເຄີຍດຳລົງຕຳແໜ່ງສະມາຊິກວຸທິສະພາແຕ່ລັດອັລລິນອຍສ໌ ໃນປີ 2005 ກະທັ່ງຮອດວັນທີ່ 16 ພະຈິກ 2008. ຫຼັງຈາກປະກາດລົງສະມັກການເລືອກຕັ້ງປະທານາທິບະດີສະຫະລັດອະເມລິກາ ຄ.ສ. 2008, ທ່ານເຂົ້າດຳລົງຕຳແໜ່ງໃນວັນທີ່ 20 ມັງກອນ ຄ.ສ. 2009 ຢູ່ຕືກຢູເອສແຄປິຕອລ ວໍຊິງຕັນ ດີ.ຊີ. ↑ "Birth Certificate of Barack Obama". Department of Health, Hawaii. PolitiFact.com. 8 August 1961. ສືບຄົ້ນເມືອ 2008-12-12. ↑ Scharnberg, Kirsten, Kim Barker. "The Not-So-Simple Story of Barack Obama's Youth", Chicago Tribune, 25 มีนาคม ค.ศ. 2007. ຮຽກຂໍ້ມູນວັນທີ 2008-04-13 "Meet Barack". 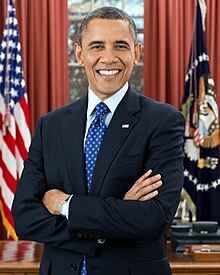 BarackObama.com. ສືບຄົ້ນເມືອ 2008-04-13. ↑ Reitwiesner, William Addams. "Ancestry of Barack Obama". ສືບຄົ້ນເມືອ 2008-10-09. Obama's maternal heritage consists mostly of English ancestry, with much smaller amounts of German, Irish, Scottish, Welsh, Swiss, and French ancestry. ↑ "Barack Obama's Irish Heritage - John A. Farrell (usnews.com)". Usnews.com. ສືບຄົ້ນເມືອ 2008-11-08. ↑ "Tiny Irish Village Is Latest Place to Claim Obama as Its Own - washingtonpost.com". Washingtonpost.com. ສືບຄົ້ນເມືອ 2008-11-08. ໜ້ານີ້ຖຶກແກ້ໄຂຄັ້ງລ້າສຸດເມື່ອວັນທີ່ ໗ ກຸມພາ ໒໐໑໘, ເວລາ ໐໗:໐໐.